Two decorative, round, bronze vanity plates secure this small oval vanity mirror in place. You and your home will look beautiful in this oval shape, transitional-modern small vanity mirror and its alluring frameless design. 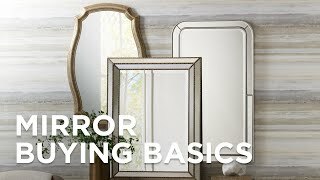 A pair of round, decorative metal vanity plates on each side of the beveled mirror glass are finished in a warm bronze and attach the piece solidly to a vanity in a few easy steps. This glistening accent from Gatco is perfect in a bath or other luxurious space. Stylish oval modern vanity mirror. Glass only measures 19 1/2" wide, 26 1/2" high, 3 1/4" deep. Hang weight is 10 pounds. BEST ANSWER: The mounting hardware is static and holds the mirror in a permanently flat position. An open look is paired with leaf and vine accents in this lovely oval wall art design. Add function and style to a bath or dressing area with this glimmering frameless vanity mirror embellished with bronze finish premium metal vanity plates.